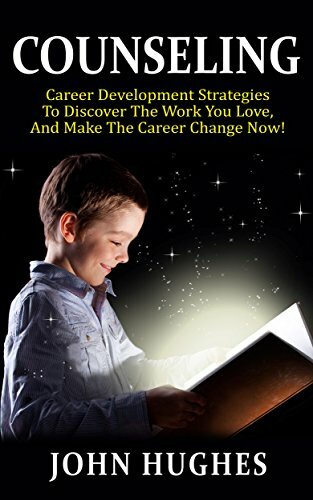 Counseling: Career Development Strategies To Discover The Work You Love, And Make The Career Change Now! Counselling: Career Development Strategies To Discover The Work You Love, And Make The Career Change Now! The global village of life is a modern day type of living that is shaping the world and the job market. It is the new landscape of the present and future workforce. As a result the choices you make with the career path you choose has to take the entire picture into focus. You have to decide what your goals are, and how you will achieve them. These are tough decisions and even tougher choices. That is why you need all the help you can get. And that is why this book was written. It was written for you, because your development is important. SCROLL to the top of the page and download NOW! How can you even double think your selection of this book? You are young, or you are seeking a change from the road you have been treading so far, whatever the case may be, you need to do so in the best possible way for your happiness and independence. So, make the investment in this book, invest in your future decisions and choices. Don’t make the mistake of thinking time is on your side; opportunity happens if you allow it. So, learn how to with this book.